Here are two clips from a 1975 interview with John Lennon, which will make you smile, and make you feel a sense of loss in equal measure. What I see here is a guy who’s very comfortable with his life, having gone through his divorce period from his three bandmates in the Beatles five years previous, and through a brief separation from Yoko Ono too (aka the Lost Weekend era from 1973 – 1974). 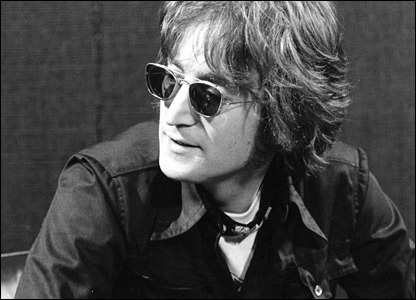 Although still in the throes of a Green Card dispute with the American government, Lennon is beginning to feel at home in New York City, a place which (as he explains) is “24 hours”, with every nationality converging. And very sweetly, he shows his affection for England- he misses English chocolate biscuits. At this point in his career, he’d completed his rock n’ roll covers album appropriately titled Rock ‘n’ Roll , and had done a guest appearance with Elton John at Madison Square Garden (his first live appearance in some time at that point) in 1974 and on David Bowie’s song “Fame”, which he co-wrote. Most importantly, he’d reconciled with Paul, George, and Ringo (well, he never fell out with Ringo…), and no longer felt as if a Beatles project was entirely out of the question. This is a striking contrast to the bitter Lennon from 1971’s Rolling stone interview “Lennon Remembers”. In this interview almost five years afterwards, Lennon is full of humour, eager to talk about his Beatle days, and just plain gracious. In this interview, he’s laid-back and likeable – not the intense, angry icon which many people think of when his name is mentioned. I really like this John. There are some heartbreaking concepts to be considered here, given that we’re viewing this in a post-assassination context. When watching this, I got the feeling that we are living in an alternate universe, that someone has messed with the space-time continuum. Lennon was supposed to live. And the Beatles were supposed to make more albums, maybe concurrent with their own solo careers. They were meant to reconvene for a tour in 1981, as was the rumour at the time before Lennon’s death. At very least, Sean and Julian were supposed to get to know their dad. What do you think, good people? What stands out in this interview for you? That was the gag. John said it in ‘Glass Onion’ in order to monkey with the ‘Paul is Dead’ conspiracy theorists. I suppose when I say that John was the Walrus, I meant to refer to his “God”, where he announces “I was the Walrus, but now I’m John”, one of his most profound statements about his own fame on record. It was a statement of reclamation; reclamation of his own identity, and his ownership over it.